This fast-paced narrative charts the history of the US Navy from its birth during the American Revolution through to its current superpower status. The story highlights iconic moments of great drama pivotal to the nation's fortunes: John Paul Jones' attacks on the British during the Revolution, the Barbary Wars, and the arduous conquest of Iwo Jima.American Naval History: A Very Short Introduction illuminates the changes--technological, institutional, and functional--of the U.S. Navy from its days as a small frigate navy through the age of steam and steel to the modern era of electronics and missiles. Renowned naval historian Craig L. Symonds captures the evolving culture of the navy and debates between policymakers about what role the institution should play in world affairs. Internal and external challenges dramatically altered the size and character of the navy, with long periods of quiet inertia alternating with periods of crisis that spurred rapid expansion. 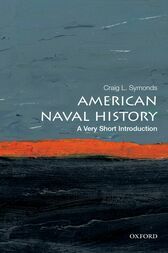 The history of the navy reflects the history of the nation as a whole, and its many changes derive in large part from the changing role of the United States itself.ABOUT THE SERIES: The Very Short Introductions series from Oxford University Press contains hundreds of titles in almost every subject area. These pocket-sized books are the perfect way to get ahead in a new subject quickly. Our expert authors combine facts, analysis, perspective, new ideas, and enthusiasm to make interesting and challenging topics highly readable.